While I may not have been sure exactly where the last branch was located, I at least had some idea. When I dragged my friend to this branch she had absolutely no clue where she was at all. I'm sure it didn't help that she just moved to Vancouver recently (to start the same library school program as me), and that this library is located in a place where even few Vancouverites would ever visit. But sometimes there's something more important than location when choosing what library to visit. And so it was on this particular day when a shopping trip at Value Village had gone on for longer than had been expected, and while the next step was dinner it was suggested (by me) that a movie would be a good thing to watch while eating. (Unfortunately, I only own one DVD: a collection of the 1950s Flash Gordon TV show. Despite my love of Flash Gordon, that show is pretty terrible. I've only actually watched one episode (though had the whole thing playing on a projection screen when I ran a campaign of Cosmic Patrol). The whole thing was filmed in Berlin, and the director said "No matter what galaxy we explored, everyone spoke with a German accent." Totally rad. Thankfully I'd earlier checked which (if any) libraries in the area were open that evening, and knew that this one was! So we hopped on a bus to...somewhere. I may have checked the VPL site, but I definitely hadn't checked which buses go where, and I wasn't even entirely sure where we were going. I am a master strategist. But before long I recognized where we were, and we got off the bus and hurried to the library. This library is super hidden in the back of a strip mall, and I'm sure it didn't help my friend's confidence in my direction finding abilities when I led her down an alley shortcut on our way (though the alley was surprisingly well-lit and non-sketchy). We arrived with fifteen whole minutes to spare, and quickly set about trying to find a DVD. 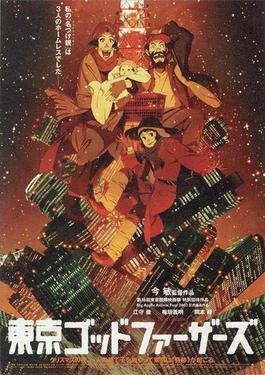 We went with Tokyo Godfathers by died-too-soon director Satoshi Kon. It is a film that I would show to people who do not think that animated films can tell stories that aren't for children. The story is about three homeless people in Tokyo who find a (live) baby in the garbage on Christmas eve and attempt to return it to its parents. It's really good! The story doesn't feature any robots or laser guns, yet I still really enjoyed it. The movie is funny and emotional and you end up thinking about the lives homeless people live. It's also beautifully animated. I get the feeling that if this had been a live action film it would be far better known, as its themes, stories, and characters are ones that are often depicted in more popular films. I think it's too bad this hasn't been seen by more people, and I hope that at some point it manages to capture the wider audience it deserves.